We're realists here at EmpirePromos, so we know that at least some of your customers, patrons, students or employees have a sweet tooth, or sweet teeth. 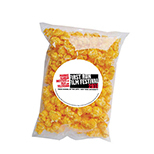 And the best way to someone's heart is through their stomach, so we've amassed a collection of the finest promotional candy, chocolate, popcorn, cookies and more. Food gifts grab immediate attention and generate good will. At Empire Promos, all our products have our vote of confidence. Never is this more significant (or enjoyable!) than in the category of Food, Candy & Drink. (Who doesn’t need a snack sometimes?) It is said that the two most vital human needs are for food and shelter. Through our office we’ve “sheltered” a huge collection of the best of the best taste sensations with you and your clients satisfaction in mind. 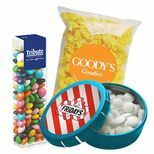 Everything from popcorn, pretzels and cookies, to jelly beans, mints, gum dispensers, hard candies and chocolates and, oh yes, a selection of healthy bottled beverages. Universally popular and delicious, bottled beverages are great for adding a light touch to any occasion, pr...More on Promotional Food, Candy & Drink. It is said that the two most vital human needs are for food and shelter. Through our office we’ve “sheltered” a huge collection of the best of the best taste sensations with you and your clients satisfaction in mind. Everything from popcorn, pretzels and cookies, to jelly beans, mints, gum dispensers, hard candies and chocolates and, oh yes, a selection of healthy bottled beverages. Universally popular and delicious, bottled beverages are great for adding a light touch to any occasion, promotional event or trade show as well as for office gifts that are guaranteed to create a good feeling about your business. All at an affordable price, all ready for your imprinted logo to be customized just right. Did you know that popcorn is not just for movie theaters anymore? It has gone gourmet! Our gallon-size tins can feed a crowd. For those who covet sugar instead of salt, these tins are also available filled with cookies. Not an easy choice. Everyone knows that sweets are a welcome treat for people of all ages, not just kids. Full disclosure: we too have a sweet tooth. Ours include favorite brands like Hershey’s, Reese’s, Mars M&Ms, Ghirardelli and Skittles. 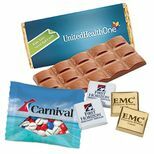 They make great party favors, handouts at parades and trade shows. We also have fancy candy gifts, power bars for those who exercise their fondness for fitness, loads of lollypops and lots more, including sugar free and kosher certified varieties. Our custom printed breath mints are like a breath of fresh air. They are perfect for trade show giveaways, as sales call leave behinds or simply as a quick refresher after dinner or anytime else. 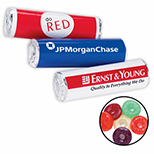 We have novelties in the shape of a tee shirt or a jersey shaped case filled with peppermints that are a natural for an apparel manufacturer or retailer. 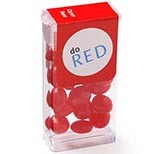 For banks, financial institutions and financial planners, what could be better than dollar signs filled with mints, or how about a tooth shape for dental clinics, toothpaste manufacturers or health care promotions? Let us know what your particular branding needs are and we’ll help you pick the perfect item to freshen your marketing campaign. One of the sweetest things we’ve heard lately is that chocolate can be healthy. 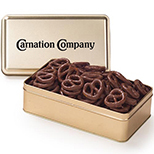 Great news since chocolate gifts are among our most popular for pleasing present and prospective clients. Assorted, milk or dark, how do we love chocolate? Let us count the ways. Consider the reception you’ll get from elegant, mouthwatering truffles, chocolate covered almonds, chocolate cigars to celebrate a new baby or new account, foil wrapped hearts for Valentines Day or any day you want to show appreciation. And what sports fan wouldn’t have a ball with chocolate baseballs, basketballs, footballs, golf balls, soccer balls or tennis balls? Yet another marketing opportunity lies in the recent craze for bottled water and energy drinks. Be it for environmental reasons, increased awareness of the importance of staying hydrated or the growing interest generally in health care and fitness, there’s never been a better time to boost your brand than with one of our items targeted to this market. 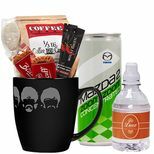 Other popular drink items include cello wrapped tea bags, a coffee pod with sleeve, and gift packaged mug sets with coffee or chocolate. Every one a great perker upper for employees. These are just a few of our favorite things. If you have any questions about our Food, Candy & Drink products, or need some guidance for your company's next promotion, we would love to help. Please contact us at 1-877 4PROMOS /1-877 477-6667. Ordering from Empire is easy!